At Loop Perio, we offer our Chicago area patients comprehensive state-of-the-art dental and periodontal services. 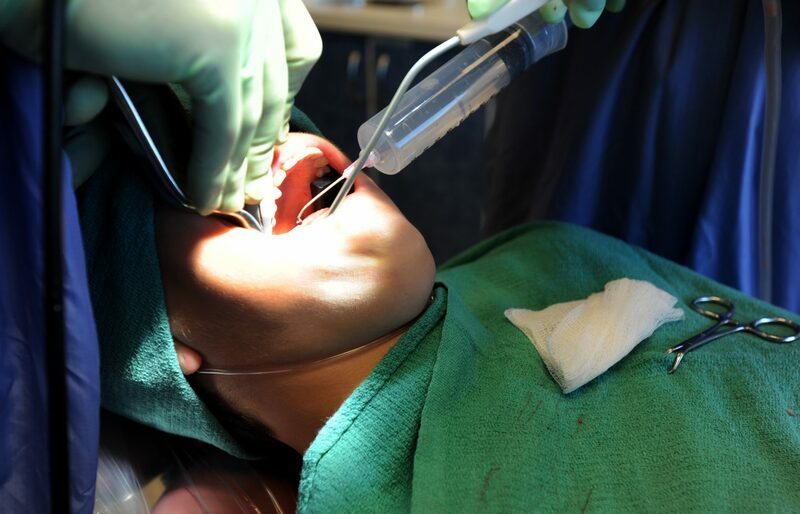 One of those services is pocket reduction surgery, also known as osseous surgery, flap surgery, and gingivectomy. Dental pocket reduction surgery removes harmful bacteria and tartar (calculus) present at the roots of teeth. When your mouth is healthy, your teeth sit securely in your gums. But when tartar forms, harmful bacteria create acid that demineralizes tooth surface and attacks the gums. The result is periodontal disease (gum disease.) Nearly half of all Americans will suffer from gum disease at one point or another in their lives. 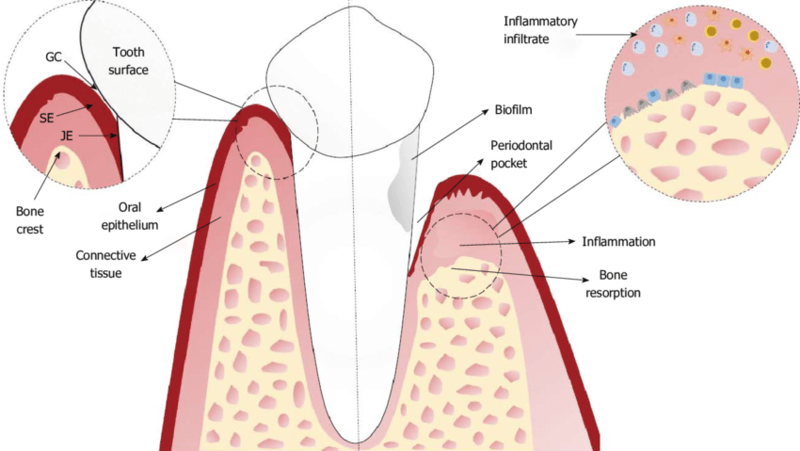 Periodontal disease is a chronic progressive inflammatory infection. Over time, as it works its way below the gum line into the subgingival area where it destroys both gum and bone tissue. As a result, pockets appear between the teeth and gums where there should be healthy tissue. No longer firmly anchored in position, teeth become loose and can even fall out as the extensive bacteria growth continues. The term gum pocket reduction surgery actually refers to several pocket reduction surgery procedures intended to turn this destructive process around. Can You Avoid Pocket Reduction Surgery? Upon encountering a discussion of dental pocket reduction surgery, your first reaction may well be to hope you never need it. And you might not. To maximize your chances of avoiding gum disease and the formation of dental pockets, you need a two-pronged approach, an effective daily oral hygiene routine combined with regular dental appointments for checkups and cleanings. An effective dental hygiene routine involves brushing and flossing. You should brush twice daily for two minutes each time using fluoride toothpaste and making sure to clean every surface. Floss once a day and get between all your teeth including the ones in the back of your mouth. Also use mouthwash and clean your tongue. Your dentist can provide additional tips on brushing and flossing effectively and what specific products will serve you best. But even if you follow an effective daily dental hygiene routine scrupulously, you still need to visit your dentist regularly, at least twice a year and more if recommended. Regular checkups can detect developing problems early, before you need an intervention like pocket reduction surgery, and cleanings remove plaque and tartar. When you eat, the food residue in your mouth combines with bacteria to form a sticky film called plaque. Brushing and flossing won’t necessarily get rid of all of it, and given the chance, plaque hardens into tartar, which they definitely won’t remove. Only a professional dental cleaning can do that, and it’s tartar that provides the fertile breeding ground for the germs that produce periodontal disease and ultimately gum pockets. You can also reduce the possibility of gum disease and gum pockets by eating a healthy, balanced diet. It’s an unfortunate truth, though, that you won’t automatically eliminate all chance of periodontal disease and the need for dental pocket reduction surgery even if you make a good faith effort to practice proper oral hygiene. Hormonal changes like those associated with pregnancy or menopause. Various medications like certain heart medications, oral contraceptives, and antidepressants. Other diseases that interfere with the body’s inflammatory system including diabetes, rheumatoid arthritis, and cardiovascular disease. New spaces between the teeth. Teeth that look longer than before because the gums have receded. To plan for dental pocket reduction surgery, the periodontist must first determine the location and depth of gum pockets. This is accomplished by measuring the pocket depth of the space between the gum and the teeth. A dental probe goes into the gum beside a tooth and below the gum line. A healthy, normal depth is 1 to 3 millimeters. A greater depth may indicates periodontal gum disease, and a depth greater than 8 millimeters indicates the presence of a pocket that normal brushing and flossing will definitely not be able to clean properly. Are the symptoms intermittent or constant? Do you use tobacco (either smoking or chewing)? What medications do you take, both prescription and over-the-counter? What Can Pocket Reduction Surgery Achieve? Fight the spread of bacteria. This is necessary not only to promote oral health but also to preserve health in general. Harmful oral bacteria can migrate to other parts of he body via the bloodstream and have been linked to stroke, heart disease, and diabetes. Stop bone loss and the eventual loss of the teeth they hold in place. By eliminating harmful bacteria, the periodontist eliminates the chronic inflammation they produce and the deterioration of bone tissue resulting from that. Make home care more effective. Gum pockets make it difficult for a patient to brush and floss effectively because brushing and flossing can’t reach all the way to the bottom of the pockets to clean. Make the smile more attractive. When gum pockets are present, it’s likely that rotting teeth, ridge indentations, and brown gums spoil the appearance of the sufferer’s smile. How Is Pocket Reduction Surgery Performed? The most common form of gum pocket reduction surgery begins with the periodontist separating and peeling the gum line back from the tooth. Scaling and root planing then remove bacteria and tartar from the exposed root of the tooth. Scaling is the removal of bacteria, plaque, and tartar below the gum line. There are two basic methods depending on what sort of instrument the dentist is using. If it’s a handheld tool, the dentist scrapes away the unwanted material using a metal tool known as a dental scraper and curette. Or, the dentist may use an ultrasonic tool that combines a vibrating metal tip and a spray of cool water. Scaling sometimes takes multiple visits. Four is not uncommon, with dentists dividing the mouth into four quadrants and tackling one in each session. Root planing comes into play if the root of the tooth isn’t entirely smooth. Planing makes it smooth to ensure that when the gum tissue heals, it won’t attach poorly or improperly to an uneven or rough root surface. The gum then receives antimicrobial liquid to get rid of any remaining bacteria and facilitate the healing process. Tiny stitches close incisions and dissolve on their own in 10 to 14 days. As an alternative, the periodontist may see fit to use a soft tissue laser either on its own or in conjunction with another form of periodontal pocket reduction surgery. Lasers eliminate the need for surgery and minimize bleeding. For a short time after pocket reduction procedures, teeth and gums may be slightly more sensitive, and swelling and bleeding can last a few days. Vigorous activity can make bleeding worse. A desensitizing toothpaste can help with any discomfort, and some patients receive a prescription mouthwash to keep bacteria from coming back. In all cases, it’s important for patients to follow an effective daily oral hygiene routine after gum pocket reduction surgery, again to fight the return of bacterial. Bone grafting is in order when periodontitis has completely destroyed the bone surrounding a tooth root. The bone graft anchors the tooth and provides a platform for the regrowth of natural bone. Bone grafts are sometimes made up of small bits of the patient’s own bone, donated bone, or synthetic bone. In guided tissue regeneration, the periodontist places a piece of biocompatible fabric between a tooth and existing bone. The fabric keeps unwanted tissue from getting into the space and thus facilitates the growth of new bone to replace that destroyed by bacteria. Tissue-stimulating proteins are applied to the diseased root of a tooth in the form of a special gel. The proteins are the same ones present in developing tooth enamel, and they aid in the growth of new healthy tissue and bone. Ideally, patients undergoing any sort of surgery should be in good health overall. Gum pocket reduction surgery may be contraindicated at a particular point in time if the patient is seen as having an uncontrolled condition like gum disease, HIV (AIDS), an immuno-compromised condition (in other words, reduced resistance to disease), cardiovascular (heart and blood vessel disease), or diabetes. Certain medications can also cause problems including aspirin or Coumadin (which can make bleeding more difficult to stop), medications like the calcium channel drugs used to treat cardiovascular disease (which can cause gum overgrowth), medications used to control transplant rejection, and others. Patients who receive pocket reduction surgery can confidently anticipate a marked reduction in the depth of gum pockets and marked improvement in the condition of their teeth and gums. If you need periodontal pocket reduction surgery or treatment for any aspect of gum disease, we encourage you to contract Loop Perio for a consultation today.